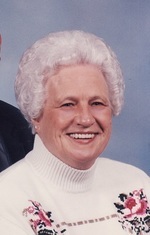 Estelle Louise Lacey, “Gar-Gar”, 83, of Avenue, MD formerly from Oakley, MD passed away on February 6, 2019 at her residence. She was born on December 28, 1935 in Oakley, MD and was the daughter of the late Estelle M. Farrell and Robert J. Farrell, Sr. Estelle was the loving wife of John Stephen Lacey, whom she married on October 16, 1954 in Sacred Heart Catholic Church Bushwood, MD. Estelle is survived by her children Pat Vallandingham, (Frankie) of Avenue, MD, Wayne Lacey (Jackie) of Mechanicsville, MD, 5 grandchildren Chris Nelson (Kristi), Cindy Williams (JF), Lynn Vallandingham, Jonathan Lacey (Danielle), and Shannon Lacey. Along with 11 great grandchildren Tiffani Russell (Zach), DJ Williams, Destiny Russell, Emily Nelson, Anthony Russell, Jace Williams, Owen Lacey, KJ Rhodes, R.J. Harbold, and Baby Lacey (due in July), and 1 great great granddaughter McKenna O’Sullivan. Siblings Robert Farrell (Lou), Agnes Hayden and Clyde Farrell (Jeryle). She was preceded in death by her great grandson Jonathan Lacey, Jr. and her brother Francis Farrell. Louise was married 64 loving years to John Stephen Lacey. She was Secretary of the family business Lacey’s Plumbing and Heating for 31 years. Louise was given the name Gar Gar by her first grandchild Cindy and has been called that every since. She is the Master of the Mashed Taytays and Pea’s, if they aren’t Gar’s they aren’t right! Everything she cooked was the most amazing thing you’ve tasted, stuffed turkey rolls, meatloaf, barbecue chicken, coleslaw, and so much more! Every family gathering at her house or not she always made several dishes. Louise spent hours in her chair with her big water cup and a word search book finishing a single puzzle every 5 minutes. Louise loved all children. Sitting in her recliner chair she would rock her grand babies and great grand babies to sleep, patting and rubbing their arms and back while singing or humming nursery rhymes. Louise had a contagious smile and a warm heart, always gave amazing hugs and loved her family deeply. You will be forever loved and forever missed, we know you are watching over us all. She was a lifelong St. Mary’s County, MD resident and graduated from Margaret Brent. Estelle was the office manager for Lacey’s Plumbing and Heating for 31 years, retiring in 1997. The family will receive friends on Thursday, February 14, 2019 from 5:00 PM to 8:00 PM with prayers recited at 7:00 PM in the Mattingley-Gardiner Funeral Home Leonardtown, MD. A Mass of Christian Burial will be celebrated on Friday, February 15, 2019 at 10:00 AM in Holy Angels Catholic Church Avenue, MD with Father Samuel Plummer officiating. Interment will follow in Sacred Heart Catholic Cemetery Bushwood, MD. Pallbearers will be Mike Lacey, D.J. Williams, Billy “Pots” Bowles, Rusty Lacey, Anthony Russell, and Jonathan Lacey. Honorary pallbearers will be Cindy Williams, Shannon Lacey, Tiffani Russell, Lynn Vallandingham, Chris Nelson, Destiny Russell, Jace Williams, Owen Lacey, KJ Rhodes, RJ Harbold and Emily Nelson. Contributions may be made to the Seventh Dist. Vol. Rescue Squad P.O. Box 7 Avenue, MD 20609. To send flowers to the family of Estelle "Louise" Lacey, please visit our Heartfelt Sympathies Store.